HomeBlogVariousAlto Sewing Machine by Sarah Dickins. 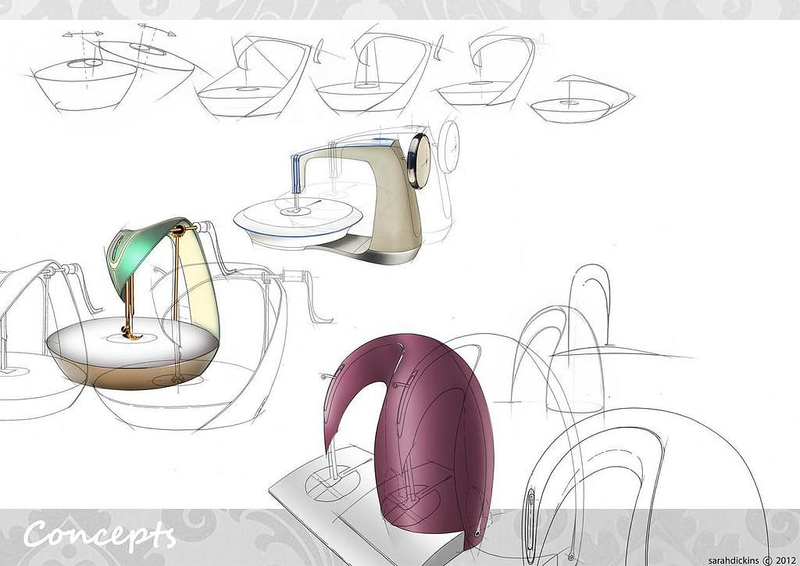 It is the result of Sarah Dickins’ participation to the design competition by the James Dyson Foundation, challenging designers to come up with innovative home appliances. The James Dyson Award is part of Dyson’s mission to encourage emerging designers to “create, challenge, and invent.” Just like James Dyson himself did many times in the past. 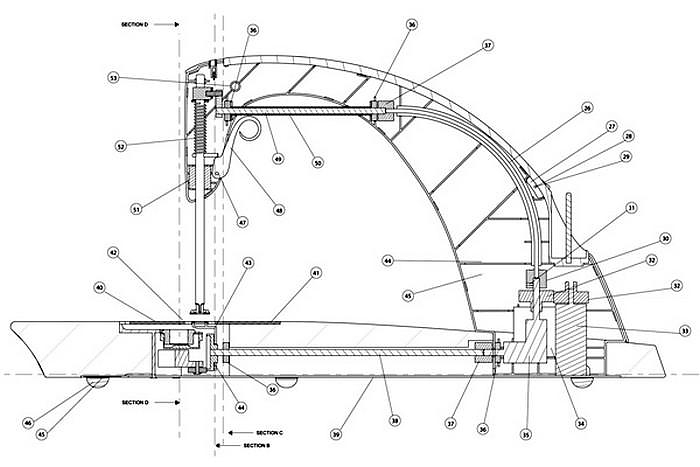 Its brief is simple and concise: Design something that solves a problem. 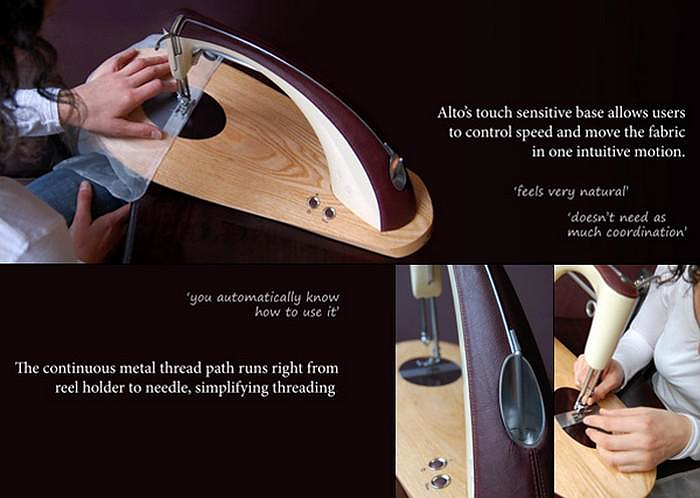 The Alto Sewing Machine concept received very positive reviews from the experts, and an even more overwhelmingly positive response from the end users. Sarah Dickins took issue with her generation’s careless relationship with clothing, which is more frequently tossed than mended, and decided to come up with a sewing machine people will love using. She designed the Alto sewing machine by means of the most scientific method an industrial designer can employ. 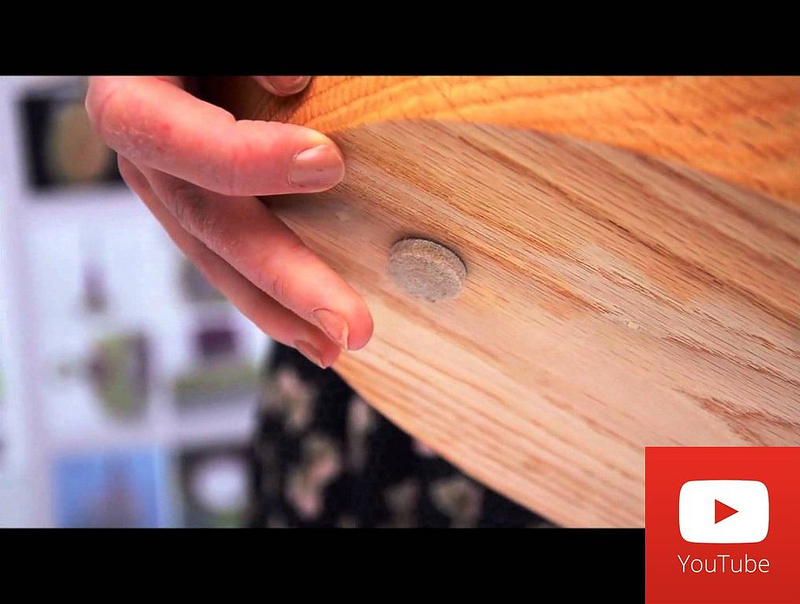 She developed her design based on the actual needs of the users, after documenting them. Prior to designing the Alto she thoroughly interview users, in order to understand the shortcomings of the current market offerings. This study uncovered that the popularity of sewing machines is dropping mainly because inexperienced users find it hard to operate a sewing machine. The learning curve of operating such a machine efficiently is steep, thus discoursing novice users. A series of usability factors had to be taken into account in order to design an innovative product that performs well and is easy to use at the same time. Sarah Dickins’ solution to the decreasing popularity of sewing and mending is a product that not only demands to be placed in full view but also offers ease of use and simplified manipulation for novices. 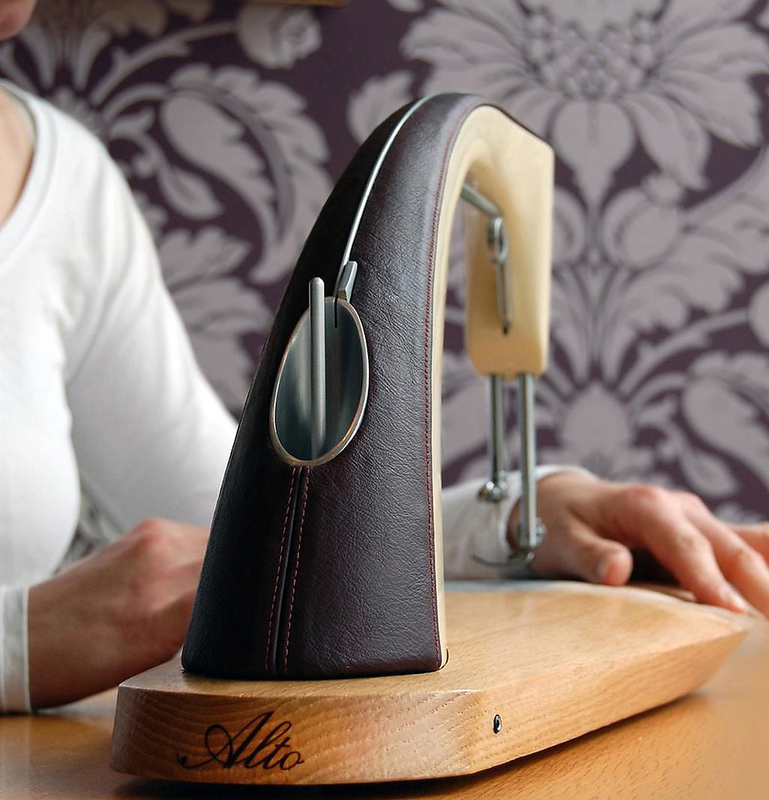 The Alto sewing machine aids the novice user with an array of innovative features. A metal guide that runs from reel to needle, for instance, makes threading a breeze. 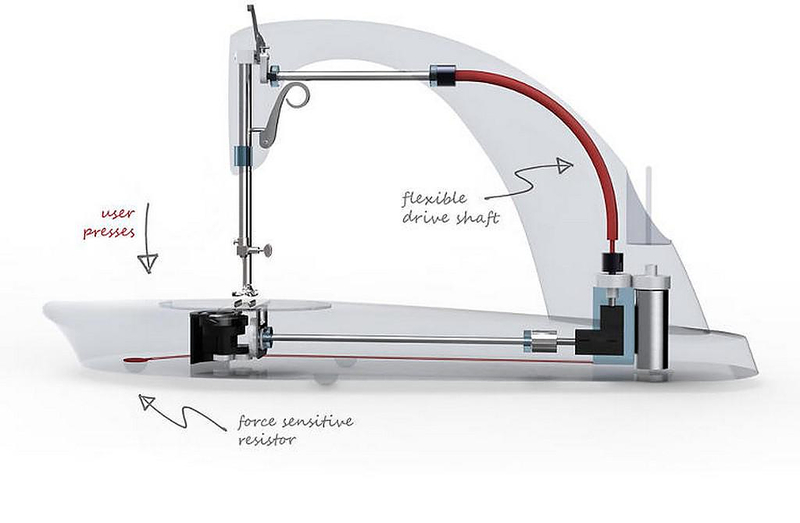 The problem of foot/pedal and fabric movement coordination gets solved with force sensor technology. Sensors in a rubber foot underneath the machine allow the beginner to control the speed from whichever hand position they find most comfortable. In addition, a flexible drive shaft replaces the traditional pulley system to create Alto’s distinctive arching form, increasing the available sewing workspace and improving visibility. 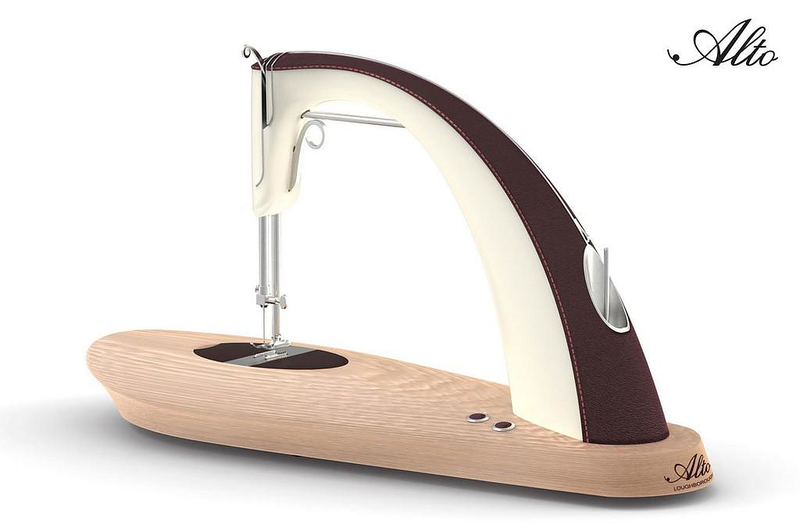 We would add that besides its functionality the Alto Sewing Machine also features exquisite aesthetics. 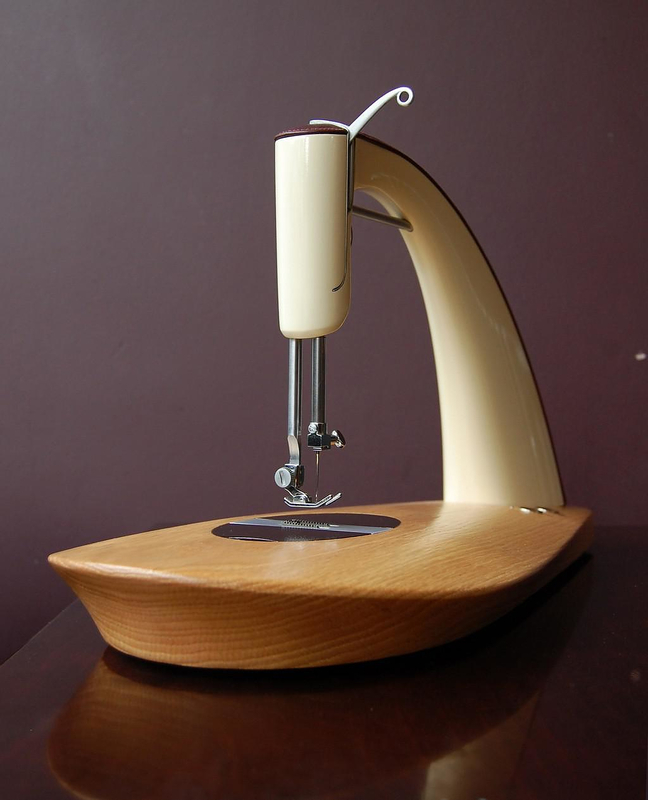 Warm materials and a retro-modern style make this a sewing machine that you will never want to hide inside a cabinet. Instead, you will want to leave it exposed on a table so that it will compel you to create. 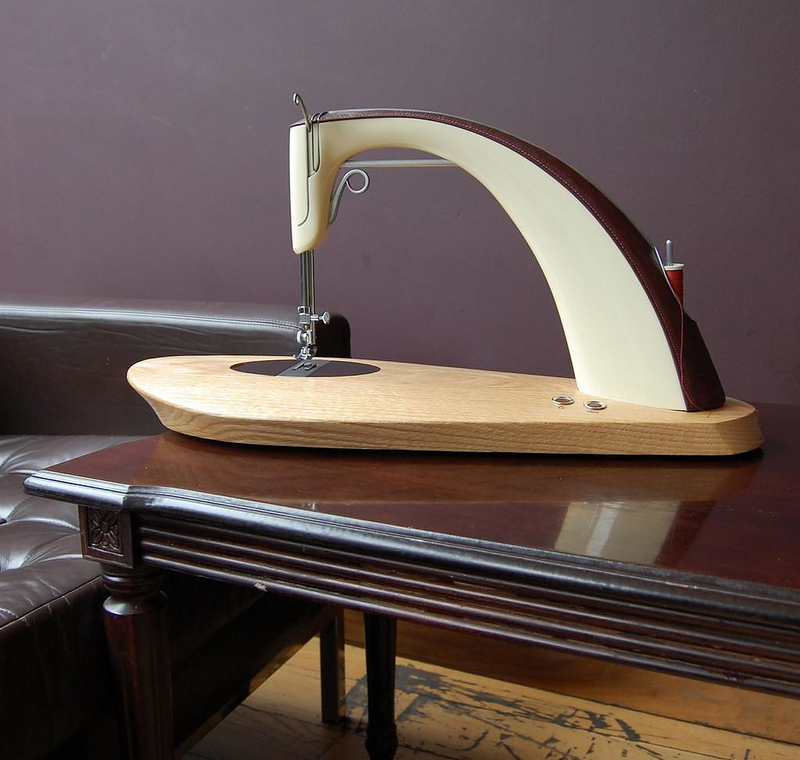 The Alto sewing machine by Sarah Dickins is in prototype stage for now, yet we sincerely hope to see it in production soon. Well done indeed! The sewing machine is absolutely awesome. If you need to have a tester I. Sure will volunteer. Beautiful design. I sew on a home sewing machine nearly everyday and I would love to try this machine. I would love this machine! Beauty and practicality in one simple, ingenious design. I love this machine. I own many machines from the 1940’s to the most modern computerized and robotic machines. I spend hours daily stitching and watching my machines stitch. This is truly everything one needs. It is delightful ergonomically, functionally, and aesthetically. The sewing machine is a beauty! I have been sewing for 40 plus years and have a few machines. One machine I use and the others because I like the machines, but nothing is like this beauty. I would love to own one of these machines. Can u buy this and how much. Love the looks of it. Wonderful design. Simple, clean and beautiful. I’d love to test one! small curves I sew so often. Can’t wait for the machine to be available to we sewers! Love this machine! I sew heirloom garments and make quilts and this would be wonderful for classes and retreats. It’s simplicity reminds me of the Singer featherweight. My 12 year old daughter loves it too and wants one! She has made several large quilts and loves making clothes. When is it going to be in the market place? Does it do other stitches besides straight stitch? Where are the controls for stitch length/width?/tension? Where are any of the controls? It’s a lovely looking machine, and I like the idea of pressure sensitive stitching as well as the increased space to the right of the needle, but designing a machine based on the assumption that it’s too hard (for women, presumably) to learn how to use a standard sewing machine is absolutely absurd! If you have a manual and you can read, you can learn how to use a sewing machine or most any other machine for that matter! If this machine is only for beginners and doesn’t “grow” with its user, then once it goes on the market, you’ll see a hell of a lot of them on eBay for re-sell eventually. As I get older the space I live in gets smaller. This would sure solve the problem for me. I’ve always loved making quilt tops and have just about given up. Why? No room to leave my sewing machine out! I have been ‘eyeballing’ this machine for months,but couldn’t find any information on availability. I think It is Beautiful! And if I could afford it, would love to own one….I know it’s from Australia, so not sure it’s available in the states…So sleek in texture and design and simple artist friendly…I think will be a big hit, especially with the quilting community…Bravo! 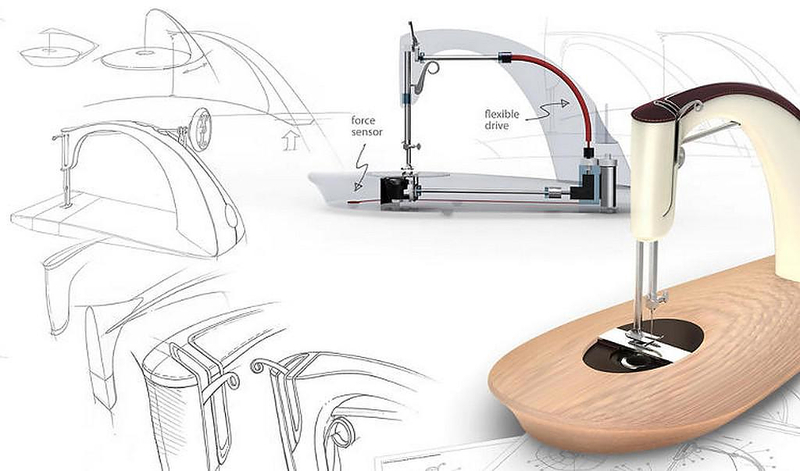 I would love to own such a beautifully designed and crafted sewing machine – bravo. I’m one who finds other machine intimidating. I’d love to see this one in the U.S. market at an affordable price. Any chance of that happening? Looks stunning but Iam aweful for get my head to close when sewing and that arm at the front would be a bit dangerous if I got to close. When will Dyson make this available for pre-order?…I’d like to get one for my non-sewing daughter…. Congrats! What a machine, beautiful to look at, easy to thread and easy to control. Absolutely fantastic design. I hope it gets past the prototype phase soon! I would love to give one of these machines a test drive! Let me know I you need someone to test it out! Love it! I really like the no nonsense design of this machine. I would love to own one and would love to be one of the first testers it not one of the first owners of this machine. Does it have other feet that comes with it?? Let me know when you put it on the market. Thank you for a new design that is innovative and neat. It looks great . How do add bobbins or wind them? I also would like to be a tester. I have been sewing since I learned how to in Home Ec class back in the day.. Absolutely LOVE! I would love to play with that machine! I wonder if free motion quilting would be a possibility. So interesting!! I would love to test it!! I love the simple elegant design.. looks like it would work wonderfully in thread painting and free motion quilting designs! 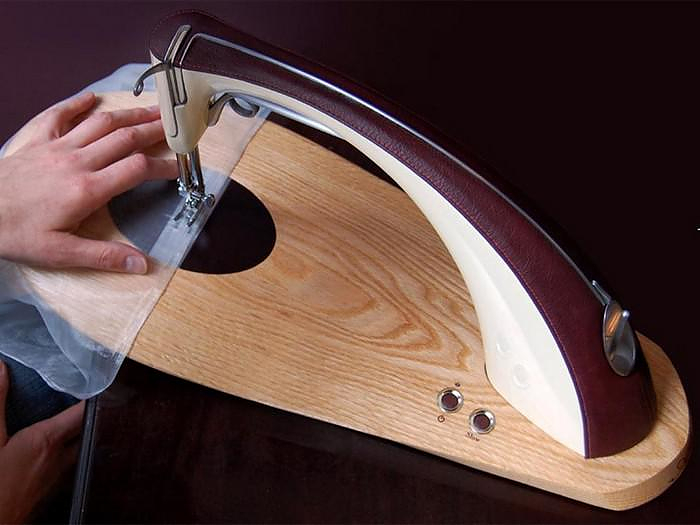 I have sewn with machines for over 70 years and this looks like a great machine. Wow! This inspires me to sew.. I love the design!.. As for comments on this not “growing” .. That suits me fine. Some of us just want the basics! Easy to use machine. Ready to go when you are! Interested in knowing the price of such a beauty though? Form follows function here with state of the art beauty. I want this for my son’s homes. I am too far gone with Baby Lock machines, but men re-purposing garments in a family is so cool. When and where can I get one… It looks beautiful and I love the sewing space. I really hope this is available soon! It is just beautiful in every way. I love it and want one! Where do you buy the Alto? When and where may I purchase this lovely machine? As a person with compromised ablilties I believe this machine is perfect! What a great design! When.and where may I purchase this machine? Is this machine coming out anytime soon? I’d love to try it out. The style is so beautiful. Is this machine available to buy now? If not, when shall we expect it’s arrival? How exciting, much anticipation from me. Are these machines available for purchase? Can one get some info on it? It’s been over three years since this article, so I’m guessing this isn’t going to make it out the gate. Too bad, nice concept. Where are these machines available to see and purchase. I’ve never seen a machine like it. I would like more information. I have been sewing and quilting for years.